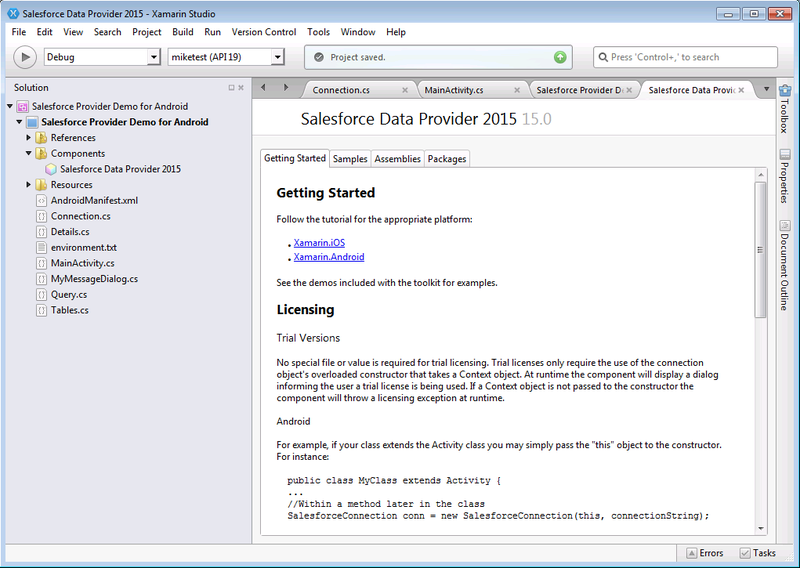 This guide shows how to set up the CData Xamarin Providers in Xamarin Studio and Visual Studio. The Xamarin providers enable you to use standard ADO.NET objects to work with disparate data sources. The code examples show how to install any Xamarin provider and write basic data access code. The provider is packaged as a Xamarin Component package (.xam), which can installed from the Xamarin Component Store. To manually install the .xam first download the xamarin-component tool provided by Xamarin. In your project right-click on Components and choose Edit Components. Click Add to Project to add the component to your package. The provider will now be visible in the "Components" list and is ready to be used in your code. Open any of the sample projects for details on how to perform basic data access in Xamarin applications. In the help documentation, you can find more data source–specific information, including tutorials on using the Xamarin provider with Entity Framework and LINQ.